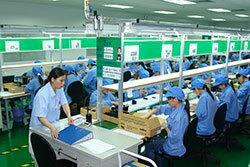 We have written QA Plans for all products in place at our factories. Even more important, China Cables Direct has dedicated QC staff in China who work alongside the QA team during production line testing and pre-shipment inspections. China Cables Direct fiber optic assemblies, copper assemblies and audio/video cables consistently meet the latest testing standards. Our On-Site Quality Control uses the most advanced testing equipment available to ensure top quality. Fiber optic cable assemblies are 100% Corning Glass and are tested using Fluke, Exfo and Interferometor testers. Test results are packaged in every order. All of our fiber assemblies meet TIA/EIA – 568-B.3, TIA/EIA – 604, EIA – 455 – X, Telcordia standards. Copper cable assemblies for both CAT 6 cables and CAT5E cables meet the following standards and are all Fluke tested with test results provided in every order. CAT 6 cables meet ISO/IEC 11801.EIA/TIA 568-B.2-1 standards CAT5E cables meet ISO/IEC 11801.EIA/TIA 568-B.2 standards. Audio/Video cables are tested to the highest standards for best high definition picture and sound. These SGS-CSTC consumer testing services, HDMI, confirmation of HDMI ATC testing and TUV certification.